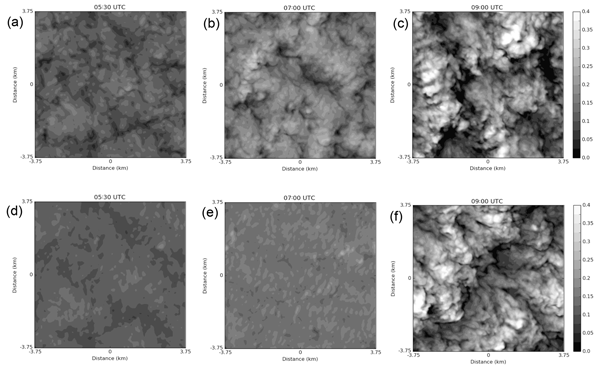 This paper shows the tracking simulation of motions and growth of the entire cloud particles, including aerosols and rain drops, in vertically developing clouds. A cutting-edge direct simulation code (i.e., the Lagrangian cloud simulator) has been run for an extremely vertically elongated three-dimensional domain, with 1 cm in width and 3 km in depth. This unique domain makes the computation-demanding simulation feasible and has led to the success of the present full tracking simulation. This study includes massively parallel simulation results on droplet collisions in turbulence. The attained maximum Taylor-microscale-based Reynolds number (Re) exceeds 103, which steps into the typical range (O(103)–O(104)) of observed Re in turbulent clouds. The results clearly show that the Re dependence of turbulence enhancement on droplet collision growth is relevant for cloud microphysics modeling. This will promote the discussion on the Re dependence of turbulent collision statistics. 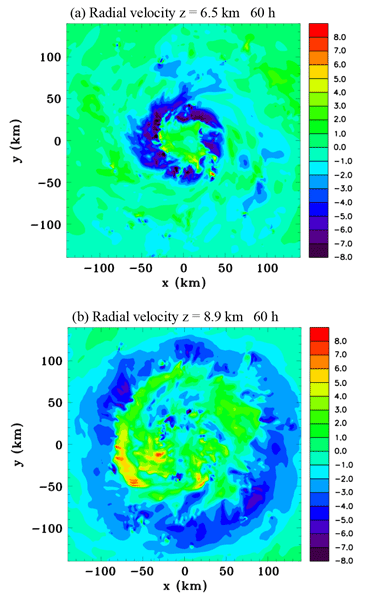 In this study we investigate the effect of turbulence on rain formation in shallow clouds. Several formulations of the collision kernel for turbulent flows using different turbulence models have been suggested in recent years. Here we compare two formulations and find that, although both give a significant increase in collision rate, the differences are quite large, especially for high Reynolds numbers as they are observed in clouds. The broadening of droplet size distributions in stratiform clouds, where the updraft velocity is almost zero, is puzzling. Without turbulence, the classical treatment of condensational growth of cloud droplets fails to explain this broadening. We investigated the time evolution of droplet size distributions using direct numerical simulations, where turbulence is resolved into the smallest scales. We found that the broadening is due to the turbulence-facilitated supersaturation fluctuations. 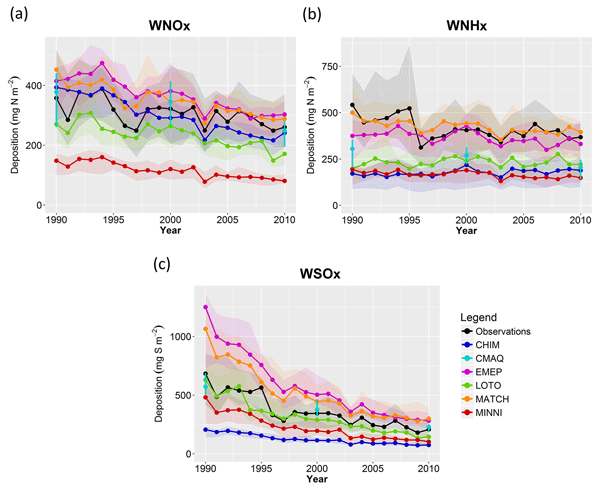 Model estimates of the mean European wet deposition of nitrogen and sulfur for 1990 to 2010 were within 40 % of the observed values. As a result of systematic biases, the models were better at estimating relative trends for the periods 1990–2000 and 2000–2010 than the absolute trends. Although the predominantly decreasing trends were mostly due to emission reductions, they were partially offset by other factors (e.g. changes in precipitation) during the first period, but not the second. 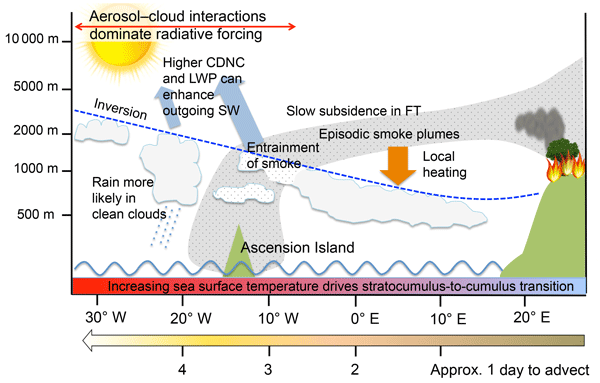 We quantify aerosol–cloud radiative interactions in a regime of deep open-cell stratocumuli (boundary layer depth 1.5 km), a regime which remains largely unexplored within this context and yet is more dominant than cases of shallow stratocumuli previously studied. 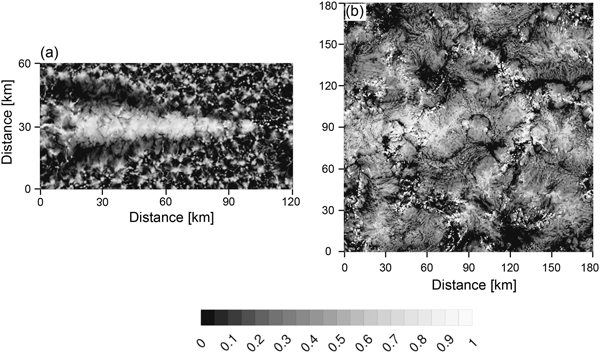 We simulate substantial increases in albedo in a regime where ship tracks are not found and argue that such changes may escape detection and attribution through remote sensing due to the large natural variability in the system. Prescribed autoconversion and accretion enhancement factors in GCM warm-rain parameterizations contribute partially to the too-frequent and too-light problem in precipitation simulation. The two factors should be regime- and resolution-dependent. A decreased autoconversion enhancement factor and increased accretion enhancement factor in the Morrison and Gettleman (2008) scheme can improve the simulated precipitation frequency and intensity. The two factors for other schemes are also suggested. 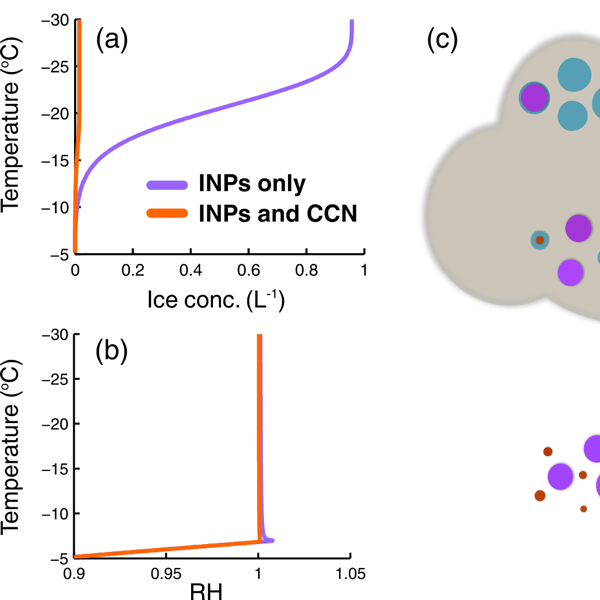 The results of this study indicate that perturbations in ice nucleating particles (INPs) dominate over cloud condensation nuclei (CCN) perturbations in Arctic mixed-phase stratocumulus; i.e., an equivalent fractional decrease in CCN and INPs results in an increase in the cloud-top longwave cooling rate, even though the droplet effective radius increases and the cloud emissivity decreases. In addition, cloud-processing causes layering of aerosols with increased concentrations of CCN at cloud top. Ice crystal formation in clouds can occur via thermodynamic nucleation, but also via mechanical collisions between pre-existing crystals or co-existing droplets. 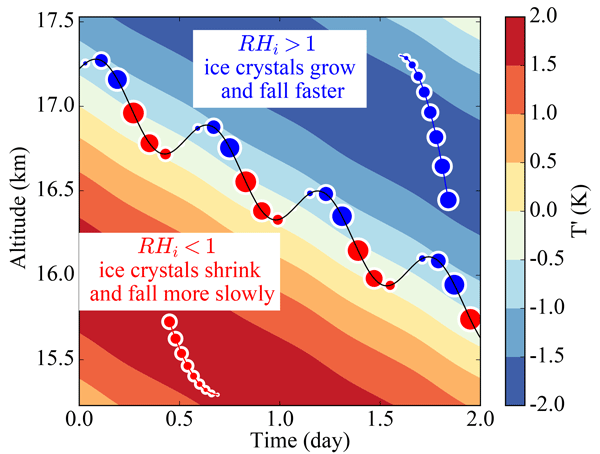 When descriptions of this mechanical ice generation are implemented into the COSMO weather model, we find that the contributions to crystal number from thermodynamic and mechanical processes are of the same order. Mechanical ice generation also intensifies differences in precipitation intensity between dynamic and quiescent regions. Mid-level vortices are often observed to develop prior to the formation of a tropical cyclone. A numerical modelling simulation of tropical cyclogenesis is carried out which shows the development of a mid-level vortex, and an analysis indicates that sublimation at the base of the stratiform ice layer plays a major role in its formation. Understanding how mid-level vortices form and their role in tropical cyclogenesis may eventually lead to improved forecasts of these major weather events. 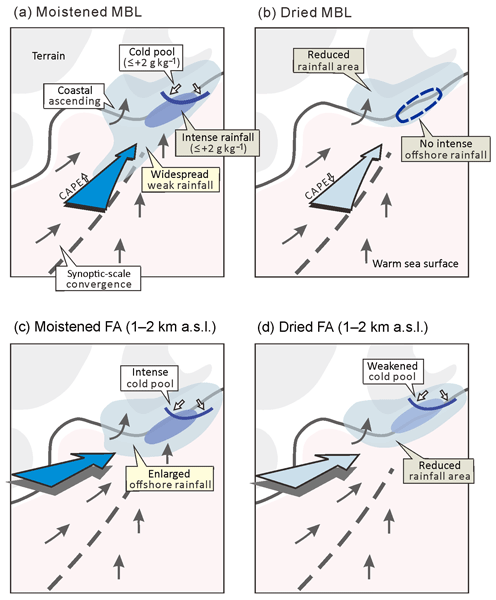 The effects of dust aerosols on ice formation within a tropical Atlantic thunderstorm system were investigated using a 3-D weather model and compared with observations. Updated ice formation mechanisms directly connect available dust particles with ice particle formation. The resulting clouds were lower and narrower and produced less rain at the surface compared to cleaner conditions, due to ice formation occurring at warmer temperatures. These results agree well with observed changes. Cloud droplet size distribution (CDSD), which is related to cloud albedo and lifetime, is usually observed broader than predicted from adiabatic parcel calculations. Results in this study show that the CDSD can be broadened during condensational growth as a result of Ostwald ripening amplified by droplet deactivation and reactivation. Our results suggest that it is important to consider both curvature and solute effects before and after cloud droplet activation in a 3-D cloud model. This paper introduces a sophisticated approach to incorporate the droplet hydrodynamic collision and condensation processes into a single DNS modeling framework. Arguably, this model provides a sophisticated approach to study the warm-rain initiation problem that has puzzled the cloud physics community for decades. 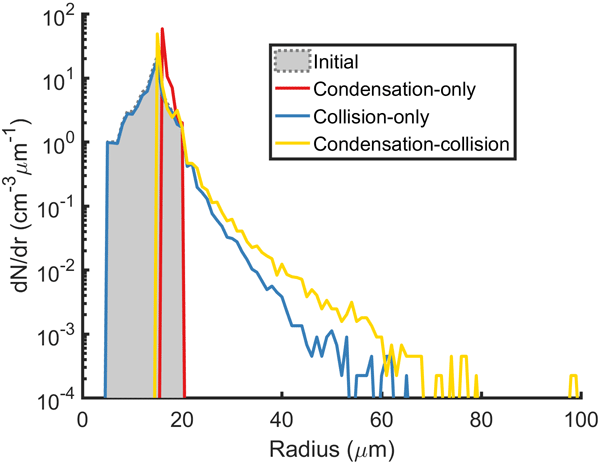 The results show the increased condensation-mediated collisions when turbulence intensifies, indicating a positive impact of turbulence on droplet condensational–collisional growth. In this paper we distill the problem of aerosol–cloud interactions to an interplay between the system's two characteristic vertical velocities, i.e., the air vertical velocity and the collective droplets fall velocity. 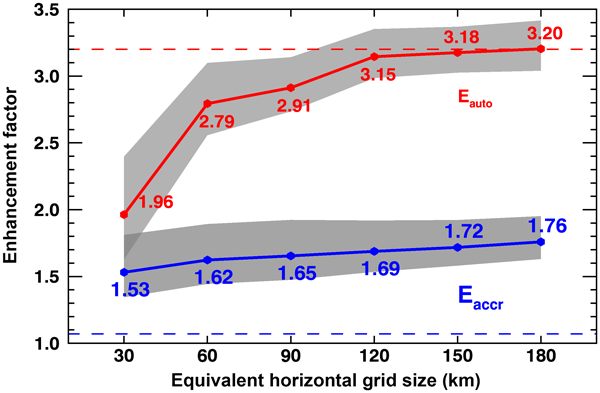 We show using theoretical considerations and cloud-resolving models that the relations between the two velocities are extremely sensitive to the cloud field's thermodynamics and microphysical properties. Soil moisture influences the occurrence of convective precipitation. An accurate knowledge of soil moisture might improve the prediction of convective cells. 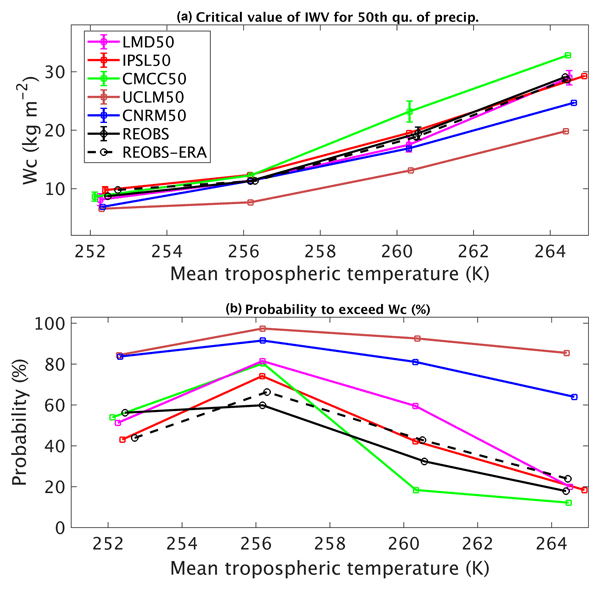 But the model uncertainty overshadows the impact of soil moisture in convection resolving models. Only drastic soil moisture changes can exhibit the model uncertainties. Both the enhanced and reduced soil moisture result in a reduced precipitation rate. 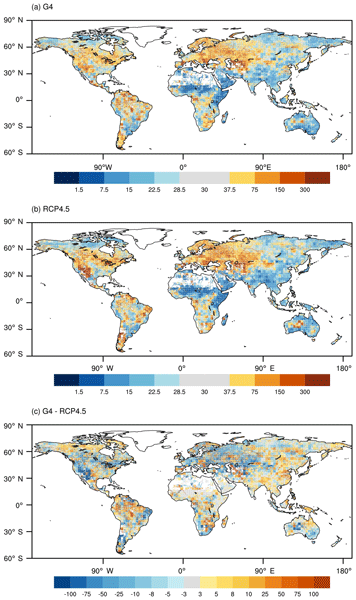 We point out the need for uncertainty estimations in soil moisture studies. Deep convection is often associated with thunderstorms and heavy rain events. 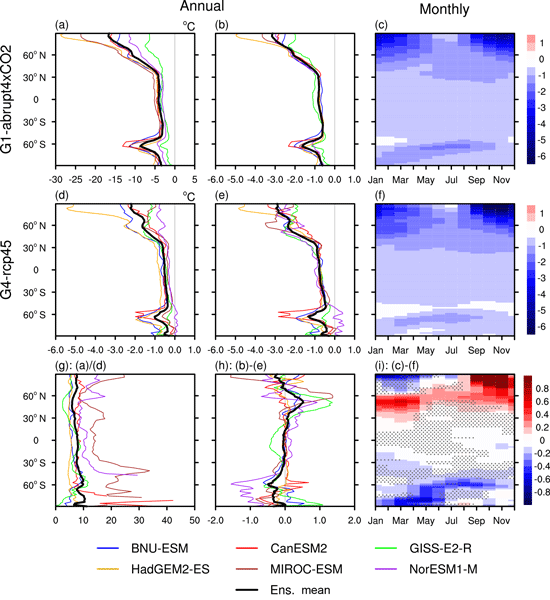 In this study, the sensitivity of Alpine deep convective events to environmental parameters and climate warming is investigated. To this end, simulations are conducted at resolutions of 12 and 2 km. 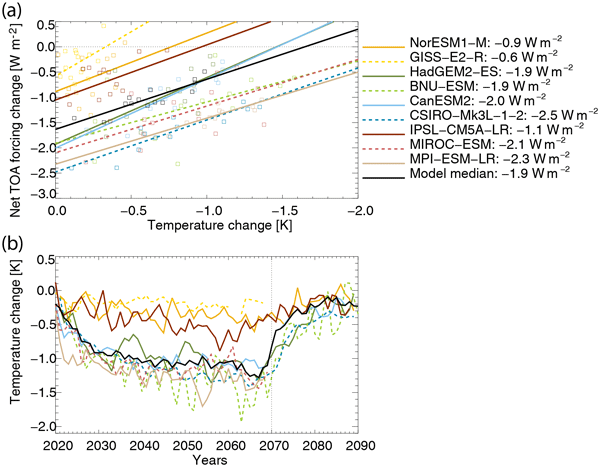 The results show that the climate change signal strongly depends upon the horizontal resolution. In particular, significant differences are found in terms of the radiative feedbacks. In this paper it is shown that the difference between the mixing diagrams for homogeneous and inhomogeneous mixing is insignificant and decreases with an increase in the DSD width. 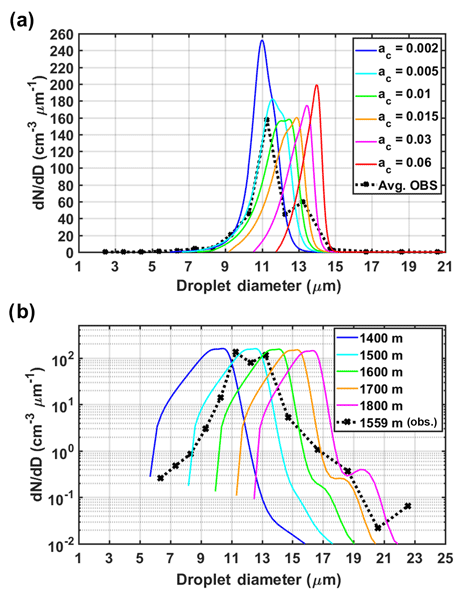 If the normalized droplet concentration is used, mixing diagrams do not show any significant dependency on relative humidity in the dry volume. The main conclusion of the study is that traditional mixing diagrams cannot serve as a reliable tool in analysis of mixing type. Ice crystals are surrounded by liquid cloud droplets in mixed-phase clouds. The coexistence of ice and water is thermodynamically not stable and the particles will influence their respective growth by condensation. This effect is known as the Wegener–Bergeron–Findeisen process. In current models, the local interactions of the particles are neglected and they can only interact indirectly. This work proposes an approach to include local interactions and discusses some implications. Simulations of the Indian summer monsoon by the cloud-permitting WRF model at gray-zone resolution (9 km) are described in this study, with a particular emphasis on the model ability to capture the monsoon intraseasonal oscillations (MISOs). 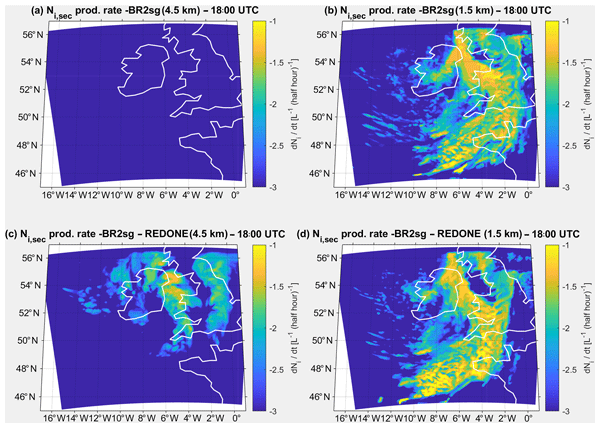 When compared to simulations with coarser grid spacing (27 km) and using a cumulus scheme, the 9 km simulations reduce the biases in mean precipitation and produce more realistic low-frequency variability associated with MISOs. 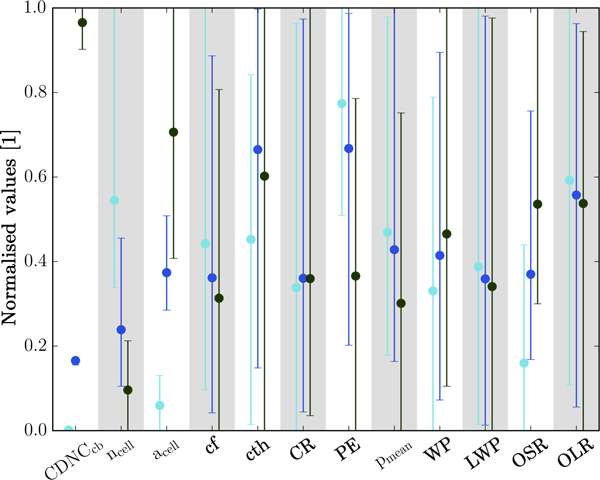 This paper compares the contribution of resolutions with that of parameterizations to errors in the simulations of clouds, precipitation, and their interactions with aerosol in numerical weather prediction (NWP) models. This comparison shows that resolutions contribute to errors to a much greater degree than microphysics parameterizations. This finding provides a useful guideline for how to develop NWP models and has not been discussed in previous studies. It is generally assumed that a positive radiative forcing of the atmosphere implies a warming of the Earth surface. This assumption is valid for well-mixed greenhouse gases but is not guaranteed for disturbances which cause a vertically variable radiative heating rate profile with warming in the upper troposphere and cooling near the surface. 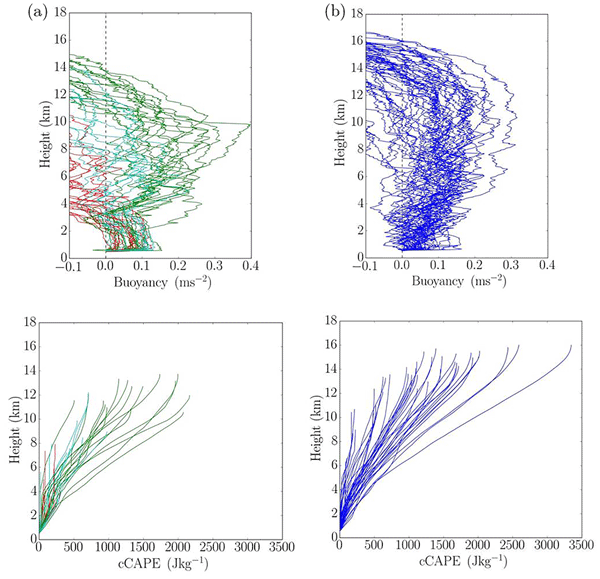 This conceptual study shows that the warming induced by contrail cirrus prevails only for fast vertical heat exchange by mixing within the troposphere. Raindrops form when small cloud droplets collide with each other. In most computer models of clouds, this process is described using the Smoluchowski equation. We compare the Smoluchowski equation with computer simulations in which each droplet within a small part of the cloud is modeled. We show, depending on the simulation setup, that the Smoluchowski equation can give overly slow or fast rain formation. This implies that many cloud models used do not correctly represent rain formation. This work shows a strong diurnal rainfall cycle over Hainan island due to land–sea breeze circulations. Years of gauge and CMORPH rainfall datasets were examined. More than 60 % of the total annual precipitation is attributable to the diurnal cycle. 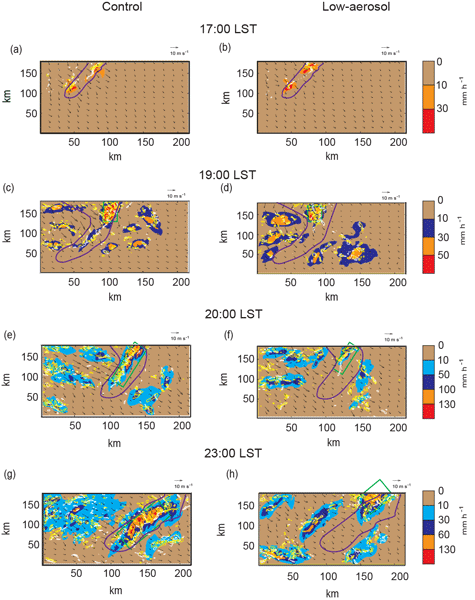 The multistage dynamics of the diurnal rainfall cycle and the related land–sea breeze circulations were analyzed based on WRF simulations. The rather high island orography is not a dominant factor in the diurnal variation of rainfall over the island. 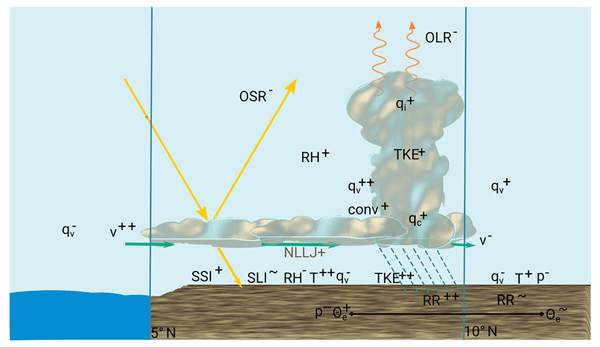 Aerosols influence cloud and precipitation by modifying cloud droplet number concentrations (CDNCs). We simulate three different types of convective cloud using two different cloud microphysics parameterisations. 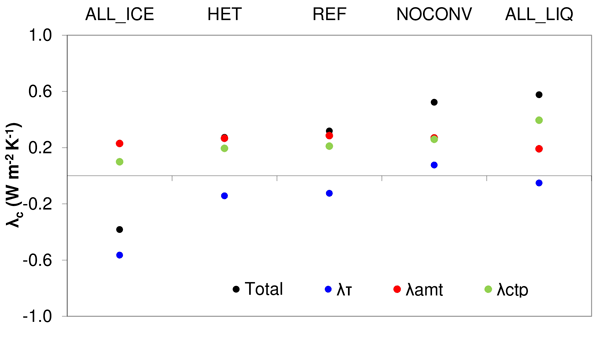 The simulated cloud and precipitation depends much more strongly on the choice of microphysics scheme than on CDNC. The uncertainty differs between types of convection. 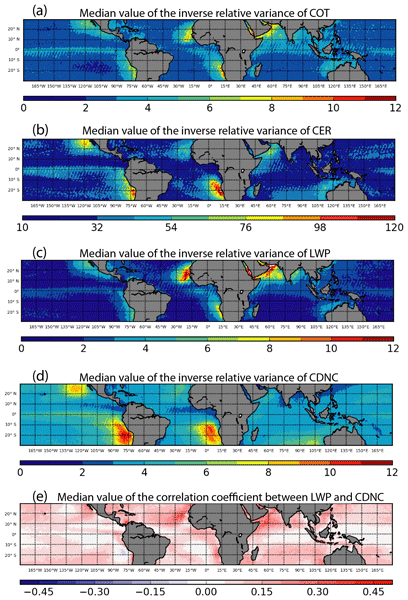 Our results highlight a large uncertainty in cloud and precipitation responses to aerosol in current models. In this study, the cloud albedo effect in climate models is investigated, separating the influence of anthropogenic sulfate and non-sulfate aerosols. Cloud albedo changes induced by added anthropogenic aerosols are found to be determined by changes in the cloud water content rather than model sensitivity to monthly aerosol variations. The results also indicate that the background aerosol is the main driver for a cloud brightening effect on the month-to-month scale. On the limits of Köhler activation theory: how do collision and coalescence affect the activation of aerosols? This study analyzes at which aerosol radius the mass growth leading to activation switches from diffusion to collection, marking the limit of traditional Köhler activation theory. It is found that collection becomes increasingly important for aerosols larger than 0.1 µm in dry radius and is responsible for all activations of aerosols larger than 1.0 µm. A novel particle-based cloud modeling approach is applied, in which activation can be represented without parameterizations.